On October 18, NorCal Bats will visit the library at 1:00pm to teach kids about this Halloween icon. NorCalBats is dedicated to the rescue, rehabilitation and release of bats throughout Northern California. They will tell bat stories, share the role bats play in the environment and bring live bats to show. Details here. Here are 8 picture books in OPL to help you celebrate these useful — and seasonally-appropriate — critters. Bats at the Library by Brian Lies (J PICBK LIES) – Bats discover an open library window and fly in to enjoy the photocopier, water fountain and especially the books and stories found there. Kids will delight picking out the famous stories the bats imagine themselves into, and the peak-roofed library featured in this book even looks a bit like the Montclair branch. 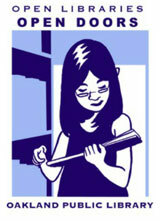 See also Lies’ Bats at the Beach, Bats at the Ballgame (not at Montclair) and Bats in the Band (not at Montclair). Stellaluna by Janell Cannon (J PICBK CANNON) – After she falls headfirst into a bird’s nest, a baby bat is raised like a bird until she is reunited with her mother. Nightsong by Ari Berk(J PICBK BERK) – A young bat is nervous about flying into the world for the first time without his mother, especially on a very dark night, but he soon learns to rely on his “song” to find his way and stay safe. Bats Around the Clock by Kathi Appelt (J PICBK APPELT) – Click Dark hosts a special twelve-hour program of American Bat Stand where the bats rock and roll until the midnight hour ends. Illustrations include a clock with the hands showing the hour mentioned in the text. See also The Bat Jamboree (not at Montclair) and Bats on Parade (not at Montclair). The Bat in the Boot by Annie Cannon (J PICBK CANNON) (not at Montclair) – A family finds a baby bat in their mudroom and takes care of him until his mother comes back for him. Bat Loves the Night by Nicola Davies (J PICBK DAVIES) (not at Montclair) – Bat wakes up, flies into the night, uses the echoes of her voice to navigate, hunts for her supper and returns to her roost to feed her baby. 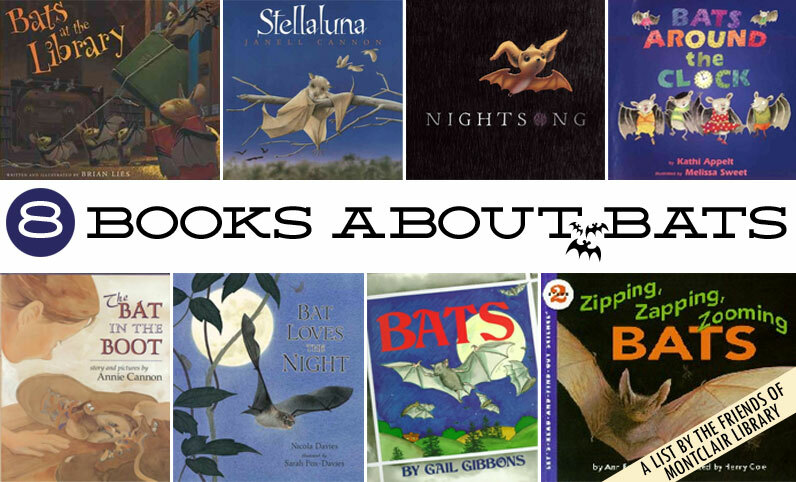 Zipping, Zapping, Zooming Bats by Ann Earle (J 599.4 EARLE) – This non-fiction choice provides basic facts about the behavior of bats and describes how they benefit the environment.